Advertising your business on Groupon is a great way to expand your audience. There is the potential of expanding the reach of your business. 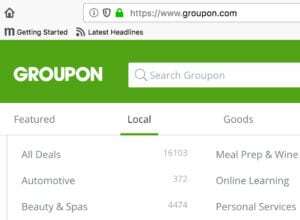 Many small businesses consider using Groupon to increase sales. However, remember these potential customers are looking for deep discounts, 50%–70% off. Plus Groupon takes an additional 50%. Make sure you have a strategy in place for how you’ll keep customers coming back. The following are things to keep in mind when using Groupon to attract new customers. Firstly, it’s difficult to make a profit directly from Groupon sales. Let’s do the math. Say you offer a service for $100. To have any hope of attracting customers you’ll have to discount your service to at least $50. Groupon takes $25. Leaving you with $25. You are probably going to lose money offering a discounted promotion. However, the exposure and reach of the promotion may benefit you later. Most businesses that benefit are ones that are more likely to have returning customers. For example, hair salons and spas often do well. They might be offering a service at a deep discount, but if the customer likes the service they are likely to return. Satisfied customers become loyal customers. In comparison, restaurants fare the worst. Will Your New Customers Come Back? Some of the cons to using Groupon are also some of the reasons people buy them. They are looking for deep discounts. Offering your services for more than half-off makes customers price sensitive. When they get something at a much lower price there’s a chance they are less inclined to pay full price for that same product or service in the future. They might be happy to spend $50, but not $100. Consider offering $100 worth of services for $50 instead. Now there’s a chance that the consumer will come in and buy more than just one item. Groupon has a low conversion rate for repeat customers, according to marketing experts. Only about 19 percent turn into repeat customers. No wonder more than 40 percent of the companies wouldn’t run a Groupon offer again. Another consideration is that enough people must purchase your promotion. It’s only valid if a certain number of consumers purchase the deal within 24 hours. Offer a discount or promotion on your Facebook page instead. It’s an effective way to engage new and existing customers at a very low cost. And you don’t have to worry about splitting your already discounted price with another parties. If you run a business targeting local clients, improving the ranking of Google My Business (GMB) listing is one of the most important things you can do for your business. To accomplish this, optimize your profile and then collect reviews and citations. Effective email marketing. Reward your website visitors something compelling in exchange for their email address. Possible options include a free digital download, a free trial, a “seat” at a webinar, site membership, a coupon, etc. In conclusion, using Groupon to attract new customers may benefit the right type of business model. It’s very important to have the right approach to turn new customers into repeat customers. Otherwsie, other options might be the better way to go.